North Sydney Bus Charters is Sydney’s corporate and business transport specialist – no job is too small or too big for us! Our staff have the expertise and knowledge to offer a premium service, regardless of what you require. We have a large fleet with Sydney’s widest range of vehicles to choose from. Whether you need to move 10 or 10 000 people, North Sydney Bus Charters will provide efficient, on-time service. Whatever the event, we are here to ensure you have safe and convenient transportation. 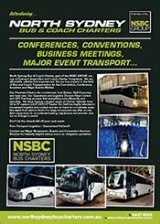 One call to North Sydney Bus Charters and we will sort all your corporate transport needs! When it comes to multi-vehicle movements, we are happy to provide one of our field supervisors to help coordinate your departures and arrivals. Unlike the other “big guys”, we wouldn’t dream of charging you extra – it’s all a part of the professional and friendly service you can expect from us. Streamline your business event by organising a reliable service with North Sydney Bus Charters. To make an enquiry or get a quote on our services, either go to our Request-a-Quote page or contact us today!